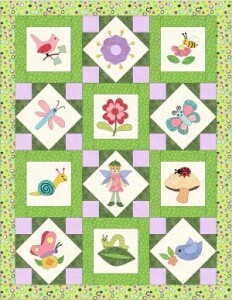 The Pixie Garden is Jeanne Rae Crafts’ Block of the Month Quilt for 2013. We’ve featured a Block of the Month project every year since 1998, making this project our 16th! Come back monthly for each succeeding step. The Pixie Garden Quilt features Pixie Posy and the inhabitants of her wee garden: Red Bird, Blue Bird, Inchworm, Butterfly 1, Butterfly 2, Snail, Bee, Dragonfly, Flowers 1 & 2, and Lady Bug on her Mushroom. This quilt was designed with machine appliqué in mind but is still suitable for hand appliqué. The twelve applique blocks will be introduced throughout the year.